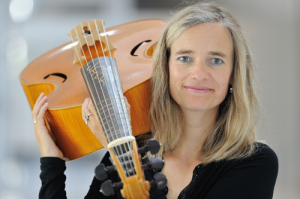 Adina Scheyhing studied viola da gamba with Pere Ros at the Music Academy in Karlsruhe, receiving her diploma in 1990.There followed postgraduate studies at the Royal Conservatory in Den Haag with Wieland Kuijken. As a well-versed continuo player and soloist, she has concertised at numerous festivals, including the Rheingau Festival, the Kassel Music Days and the Utrecht Festival. She has performed in almost all the European countries with “The Duke His Viols” (viola da gamba consort), “His Majesties Musicke” (London), “The Beggar’s Banquet” (Amsterdam), “Musica Poetica” (Freiburg) and as a violone player in various baroque orchestras. She has also participated in numerous radio, television and CD recordings. In 2009 she completed a 4-year Feldenkrais training programme (Munich City-Training with P. Newton) and has, since then, worked as a Feldenkrais pedagogue as well.